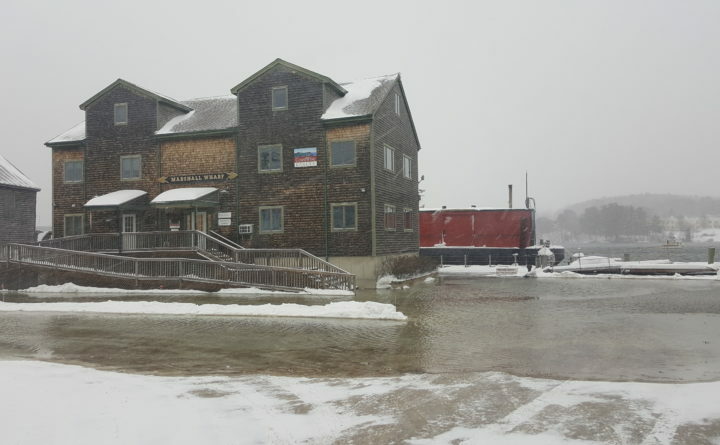 In this file photo from Jan. 4, 2017, floodwaters threatened several buildings along the Belfast waterfront as a blizzard hit the Maine coast. This story is becoming a familiar one, as similar conditions have played out in four of the past five winters. Some politicians in Washington, D.C., including President Donald Trump, have used the unusual cold to question global warming. But if they looked at the big picture, they’d see that eastern cold spells are a relative fluke in the Northern Hemisphere as a whole and that most areas are warmer than normal. Regardless what it’s called, this dipole pattern — abnormally high temperatures over much of the West along with chilly conditions in the East — has dominated North American weather in four of the past five winters. January 2017 was a stark exception, when a strong El Nino flipped the ridge-trough pattern, dumping record-breaking rain and snowpack on California while the east enjoyed a mild month. Pacific Ocean temperatures fluctuate naturally owing to short-lived phenomena such as El Nino/La Nina and longer, decades-length patterns. Scientists have long recognized that those variations affect weather patterns across North America and beyond. The new twist in this story is that the Arctic has been warming at at least double the pace of the rest of the globe, meaning that the difference in temperature between the Arctic and areas farther south has been shrinking. This matters because the north/south temperature difference is one of the main drivers of the jet stream. The jet stream creates the high- and low-pressure systems that dictate our blue skies and storminess while also steering them. Anything that affects the jet stream also will affect our weather. My colleagues and I have called this combination of natural and climate change-related effects “ It Takes Two to Tango,” a concept that may help explain the Ridiculously Resilient Ridge observed frequently since 2013. Several new studies support this human-caused boost of a natural pattern, though controversy still exists regarding the mechanisms linking rapid Arctic warming with weather patterns farther south in the mid-latitudes. Adding icing on the cake is the tendency for so-called nor’easters, such as the “bomb cyclone” that struck on Jan. 4, to form along the East Coast when the trough’s southwest winds align along the Atlantic Seaboard. The resulting intense contrast in temperature between the cold land and Gulf Stream-warmed ocean provides the fuel for these ferocious storms. It is widely expected that global warming will produce fewer low-temperature records, a tendency already observed. But it also may be true that cold spells will become more persistent as dipole patterns intensify, a tendency that also seems to be occurring. Jennifer Francis is a research professor at Rutgers University. This piece was originally published on TheConversation.com.